Crossing the Nongthymmai living root root bridge, the longest of all (known) living root bridges, in the monsoon season of 2011. Believe it or not, the whole span is made of rubber tree roots that were trained across that stream over the course of a few decades by local Khasi villagers, making it one of the world's most striking examples of biological architecture. During this trip, we'll be staying in a small village about 45 minutes from here, in a little visited corner of northeast India that's simply abounding in fantastic things to see. .....so, this is not an itinerary for the faint of heart, but I guarantee, visiting the place with the world's most dramatic weather, and seeing that weather at it's most dramatic, is an experience that you'll take with you the rest of your life. Just be ready to get rained on! Our itinerary will also take in some of the "Classic" Indian tourists sites, such as the Taj Mahal and the bustling lanes of Old Delhi, and will give you a truly unique opportunity to get on and off the beaten path. 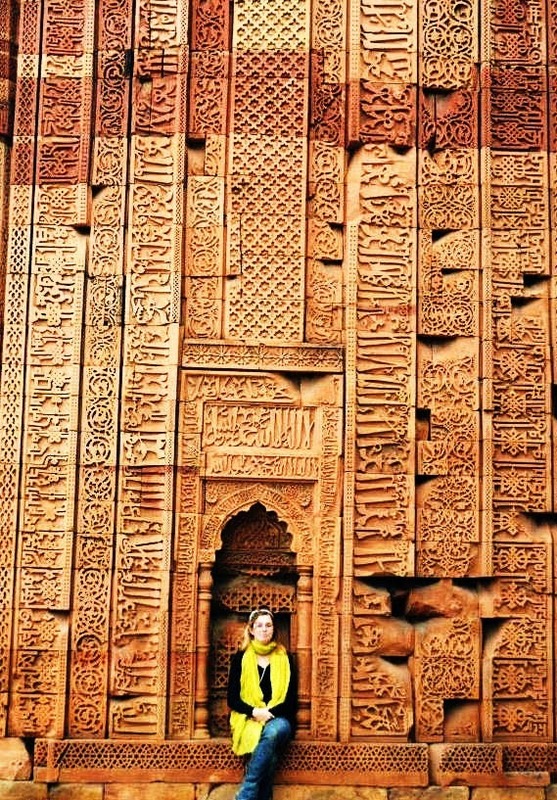 You'll see the famous stuff in Delhi and Agra, but also dozens of incredible temples, mosques, mansions, bazaars, and ruins that most visitors miss. SCROLL DOWN TO THE BOTTOM FOR A SET OF PICTURES OF WHAT WE'LL SEE! EMAIL ME AT: anselmrogers4@gmail.com if you would like more information or if you would like to reserve a seat. Surrounded by kids in Delhi. Yes, one thing the North and Northeast Indian phases of our trip will have in common is hordes of little kids. FOR JUNE: The trip starts on JUNE 13 and ends JUNE 29, not counting travel to and from Delhi International Airport. In order to confirm a seat on the June trip, please send me a small deposit (the exact amount TBA), by MAY 1ST. I'll need the balance by MAY 23. FOR JULY: The trip starts JULY 18 and ends AUGUST 3, not counting travel to and from Delhi International Airport. In order to confirm a seat on the July trip, please send me a small deposit (the exact amount TBA), by MAY 30. I'll need the balance by JUNE 27. What I'll need is U.S. 1350, payable through Paypal. WHAT THAT COVERS: All accommodation. All in-country transport, including plane tickets, train tickets, metro cards, airport/train station pickups/drop-offs, auto-rickshaws, cycle-rickshaws. Entree fees for monuments. Camera fees. Guide charges. Tips. All expenses in the village of Nongriat. WHAT THAT DOES NOT COVER: International airfare. Visa/passport processing. Health/travel insurance. Gifts. Meals in Delhi, Agra, Cherrapunji (average breakfast cost: 2 U.S., average dinner cost: 3-4 U.S.). TOTAL ESTIMATED TRIP COST: U.S. 3000 (and much less without presents!). [Note 1: Be advised that India is a very flexible place, which means that to adapt, we'll also have to be flexible. Hence, be ready for a few on-the-spot emendations to this itinerary once we get there...unpredictability is a vital part of the Indian experience. Day 1-Landing: Arrive at New Delhi International Airport. I'll pick you up there, and then we'll transfer to our hotel in MAJNU KA TILLA, Delhi's center of Tibetian culture. We'll get settled in, and then get some sleep. Day 2-Delhi: We'll start the day with a ride on the Delhi Metro. From JOR BAGH STATION, we'll take our first auto rickshaw ride to fantastic HUMAYUN'S TOMB, the mausoleum of the second Mughal Emperor and the direct architectural predecessor of the Taj Mahal. From there, we'll head to CANNAUGHT PLACE, and have a meal at a famous South Indian Restaurant called SARAVANA BHAVAN. After that, we'll take a brief sojourn to Delhi's most impressive step-well AGRASEN KI BAOLI, and one of it's most bizarre monuments, the JANTAR MANTAR, which are both within walking distance. We'll then retreat to the air conditioned metro before the worst heat of the afternoon sets in, and spend the middle part of the day resting in our hotel. Those who still have energy can come back out with me at around 3:30-4 in the afternoon, and walk to the nearby, though rarely visited (at least by foreign tourists!) NORTHERN RIDGE, an area of urban jungle with the most monkeys I've ever seen. Dinner in one of the many good Tibetan restaurants in MAJNU KA TILLA. Day 3-Old Delhi: We'll devote this day to the exploration of Old Delhi, starting with the DELHI RED FORT. From there, we'll plunge into Old Delhi's fascinating back lanes, where we'll visit an assortment of old crumbling mansions, numerous bazaars specializing in everything from silver jewelry to wedding decorations, along with a number of Jain temples and mosques. As the heat of midday approaches, we'll retreat to out hotel for our daily siesta. In the afternoon, we'll head back out to Old Delhi, and this time visit the GADODIA MARKET, Asia's largest wholesale spice market. After that, we can do a bit more sightseeing as we work our way to either KARIM'S or AL JAWAHAR, two restaurant's which specialize in Mughal food, for dinner. We'll get back early to MAJNU KA TILLA and get a good night's rest. Day 4-Delhi to Agra: We'll get up early and transfer to the NEW DELHI RAILWAY STATION. From here, we'll take an early morning train to Agra, arriving at around 8:15. We'll then transfer to our hotel in the TAJ GANJ neighborhood of Agra. For the rest of the morning, and the first half of the afternoon, we'll rest up and eat at the hotel restaurant. Then, in the evening, we'll head out to AGRA FORT. Dinner at the hotel. Day 5-Taj Mahal and Sikandra: As early as possible, we'll wake up and walk from our hotel to the entrance to the TAJ MAHAL, so we can visit the mausoleum in the least crowded, coolest, part of the day, under the best lighting conditions. We'll spend a while wandering about in the tomb complex, and then come back to our hotel and have lunch. After our daily siesta, we'll head out to the environs of Agra, to the tomb of the third, and greatest, Mughal emperor AKBAR, in SIKANDRA. Day 6-Itimad-Ud Daula-Agra Old City-Delhi: We'll get up early and visit the fantastic TOMB OF ITIMAD-UD-DAULA and if we're feeling up to it, the immensely interesting CHINI KA RAUZA. Then we'll return to out hotel and sit out the hottest part of the day. Later in the afternoon, we'll head out to the OLD CITY OF AGRA, a largely ignored maze of mansions, temples, mosques, and bazaars, which is very much off the radar of the average tourist itinerary. Following that, we'll have an early dinner at our hotel, and then head via train back to Delhi, reaching our hotel in MAJNU KA TILLA around 11-11:30 PM. Day 7-Delhi: Anyone feeling fatigued by Agra will be encouraged to sleep through the morning on this day. People who are up for it can come with me to South Delhi to visit the QUTB MINAR, one Delhi's signature buildings, along with one of India's most important historical complexes. After lunch and our daily siesta, we'll head to OLD DELHI once again, but this time we'll make the trek to one of Delhi's most extraordinary sights: FEROZ SHAH KOTLA, where thousands of people come and crowd into a 700 year old ruined mosque to ask favors from disembodied spirits every Thursday. Our dinner choices are either some relatively upscale restaurant in CONNAUGHT PLACE, or some place in MAJNU KA TILLA. Day 8 Delhi-Guwahati-Cherrapunji: Travel Day. We'll get up and take a relatively early flight to GUWAHATI, leaving the hustle and bustle of North India well behind. Flights range from two to three and a half hours. From GUWAHATI we'll get picked up by a four wheel drive vehicle and ride to our hotel, a cozy new backer's hostel called BY THE WAY in the town of CHERRAPUNJI. The ride should be between four and five and half hours, depending on weather and traffic conditions. Dinner in CHERRAPUNJI. Day 9 Cherrapunji-Nongriat: On this day, we don't have to get up early! We'll have breakfast in CHERRAPUNJI, and then transfer to a village called TYRNA, from where we'll start our 1500 foot hike down through tropical rain forest to the village of NONGRIAT, our home for the next five nights. On the hike down we'll cross two exciting wire suspension bridges, and two living root bridges. There won't be any rush. We can take our time getting there, and once we get there, we can settle in and relax. Dinner at NONGRIAT GUEST HOUSE. Day 10-13 Full days in Nongriat: These will be our four full days in the village of Nongriat. There's no point coming up with a comprehensive itinerary for these days, as what we'll do on each day will depend to some degree on the weather and how energetic people are feeling. 1: Most hikes in the area immediately around Nongriat are possible in the rain. 2: There is usually a sunny day every few days in Meghalaya, even in the monsoon season. 3: One of the most rewarding activities in the Nongriat is simply sitting around the village meeting the friendly Khasis. 1: There are six living root bridges in the immediate vicinity of Nongriat, all of which can be seen in wet weather. 2: There is an additional, partly ruined, though still very interesting, root bridge, that we can see, though walking out on it is too dangerous. 3: There are five dramatic wire suspension bridges (which are composed of steel cables that have been placed across streams) within ninety minutes walking of Nongriat. These bridges are perfectly safe, and they give the most spectacular views of the rain-swelled streams (as in, from a vantage point where you're suspended directly above them). 4: There is one bridge that is made from both steel wire and roots. 5: There are seven other Khasi villages within walking distance of Nongriat. Most of these see far fewer foreign visitors than Nongriat, and are worthwhile day hiking destinations in and of themselves. They are NONGTHYMMAI, MYNTENG, RAMDAI, PYNEM DKHAR, MAWLAKHIAT, MAUSAHEW, and TYNDRONG. The trails between these villages have many of the most spectacular viewpoints in the area. 6: There is another living root bridge in the vicinity of the village of TYNDRONG, which is the remotest village in the area. I am reasonably sure that I am the only outsider who has ever documented this bridge. The hike to it is one of the best hikes in the area. 7: While swimming in the larger streams during the monsoon season is ABSOLUTELY NOT ADVISED (!!!!!!) there are a number of smaller water bodies where it will still be possible to take a dip and wash clothes. 8: It will be possible to go out for short hikes after nightfall, on the wide, safe, concrete trails near Nongriat. All sorts of interesting animals are more active during the night, including civets, several varieties of crabs, various amphibians, and numerous insects, including a number of species of huge stick insects. Day 14 Nongriat-Cherrapunji: On this day we'll hike back up out of Nongriat, return to "BY THE WAY" in Cherrapunji, and take the afternoon and evening easy. Day 15 Cherrapunji-Delhi: We'll get up bright and early, ride to the GUWAHATI AIRPORT, fly back to Delhi, transfer to our hotel in MAJNU KA TILLA, and have dinner. Day 16 Delhi: I'm keeping this day free. If there was something else in Delhi that we missed earlier in the trip, we can see it on this day. Also, we can start shopping for presents and souvenirs. Day 17 Delhi-End of Itinerary: The morning through early afternoon are free. More shopping, or perhaps a visit to a sight in Delhi. Transfer to onward destination. This trip WILL INVOLVE QUITE A BIT OF WALKING, much of it over very difficult terrain. Most of the trails in Meghalaya are little more than thousand foot staircases. Additionally, we will have to do some of these hikes with large packs. While we will not be in a rush at any time, and people of different physical abilities will be encouraged to go at their own respective paces, it is highly recommended that you be prepared to do some fairly tough hiking. All the most beautiful views in Meghalaya are won with physical exertion. To train, walk up and down lots and lots of stairs. Additionally, anyone with either a fear of spiders, or of heights, should be advised that we will be seeing plenty of both, frequently at the same time. As this is a Summer trip, the temperatures will be quite hot. In North India, we'll plan it out so that we'll be indoors during the middle of the day. This does mean that we'll be going out and doing some of our sightseeing before breakfast. This has some advantages besides the temperature being at its most moderate. For example, we'll see the Taj Mahal in the best light of the day, at the time when the crowds are smallest, and when there's the least hassle. We'll also be out during most evenings. In Meghalaya, it's going to rain....ALOT. Bring rain-gear, and make sure you have some sort of waterproofing on your backpack. Fortunately, the temperatures in Meghalaya are more moderate than in North India. Still, when it's not raining, the air will be exceptionally humid. Though we may get a sunny day or two, we'll probably end up doing much of our hiking in the rain. When it is raining, the temperature is usually quite pleasant. FOOD: Food tends to spoil easier in the Summer months due to the heat. For this reason, meat should generally be avoided unless it's from a relatively upscale restaurants with decent health standards. Leafy greens and unwashed fruits/vegetables should also be regarded with suspicion. Eating street food is generally unwise, particularly cut fruit. There are some exceptions, which I'll show you when we're there. Fruits with peels or rinds (bananas, oranges, litchis, unopened watermelons) are usually fine. WATER: In Delhi, Agra, and Cherrapunji, only drink bottled water, and avoid drinks with ice. DO NOT PUT TAP WATER IN YOUR MOUTH FOR ANY REASON! Do not share water bottles, as this can facilitate the transmission of stomach ailments (this goes even if you're feeling fine). The water in Nongriat village is potable. HEAT: Particularly in Delhi and Agra, always make sure to have at least 2 two liter bottles with you. Drink as much water as you can. Additionally, never go out into the heat of the day when you are hungry, as having an empty stomach will magnify the physical stress of being out in the heat. Salty foods and snacks prevent dehydration. Bring plenty of snacks with you, at all times. BUGS: While you should consult with your doctor as to specific medications to be taken to combat certain mosquito and other insect born diseases, it is also highly recommended that you have a ready supply of bug spray. For Nongriat, see photos below. Humayun's Tomb, the architectural predecessor of the Taj Mahal, and the first major sight on our itinerary. Delhi. Agrasen Ki Baoli, Delhi's most impressive step-well, which is improbably located right in the middle of the city's business district. 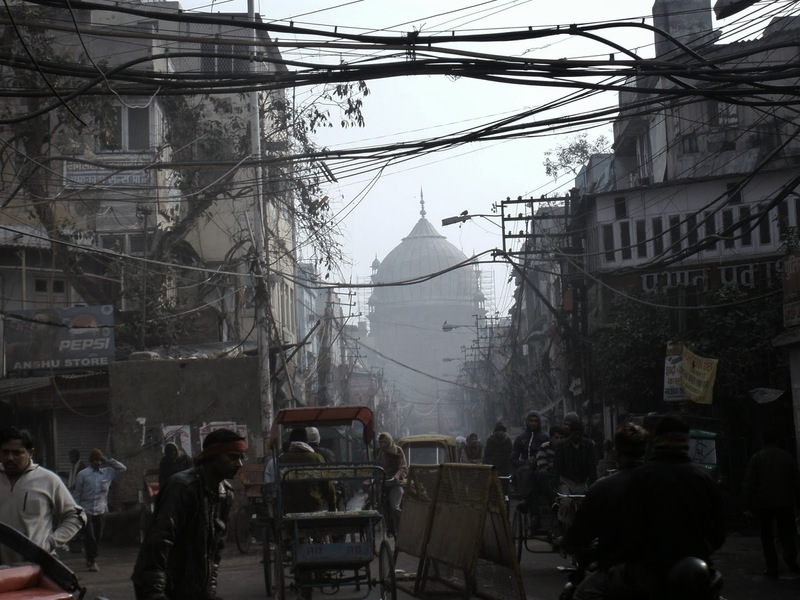 The crazy lanes of Old Delhi, with the 17th century Jama Masjid, one of India's largest and most famous mosques, in the background. The Agra Red Fort at dawn, facing East towards the Taj Mahal. The reflection of the Taj Mahal at dawn. Agra. The tomb of Akbar the Great. Perhaps the most interesting building in Agra, Akbar's tomb may not be nearly as famous as the Taj, but it is nearly as impressive, in it's own, unique way. Tile decorations on the side of one of Agra's most unusual buildings, the Chini Ka Rauza. A courtyard in the rarely visited (by outsiders) old city of Agra. The Qutb Minar at dawn. The Qutb Minar was built as a monument to the triumph of the first Islamic conquerors of Delhi. The Nongthymmai bridge, the longest known living root bridge, late in the monsoon season of 2012. This is 45 minutes from our guesthouse in the village of Nongriat. Cliff face and seasonal waterfall through a break in the clouds. In the dry season, there is no waterfall there at all. This was taken near the town of Cherrapunji. Nohkalikai Falls, near Cherrapunji, on a sunny day late in the monsoon season of 2012. The size of the waterfall increases dramatically after a major rain. This was taken from a small overlook several kilometers outside of Cherrapunji. Cliff face and numerous small waterfalls, from the trail that leads down to our guest house in the village of Nongriat. The monsoon season is exceedingly green. Tyrna Village, which is where we start our hike to Nongriat. A wire suspension bridge near Nongriat. Nongriat village in the green. The world famous Double Decker living root bridge, which is literally a one minute walk from our guest house. The Nongriat Guest house in the rain. It got a new paint job since this photo was taken. It's basic, but it's cozy enough, and you couldn't ask for a better location. A waterfall just upstream from the guesthouse. This waterfall doesn't exist in the dry season. One of the most spectacular spots in the area, about 20 minutes from the guest house. In front is a hybrid root-wire bridge. Behind that is a true living root bridge, and behind both of them is a waterfall which is no more than a tiny drip in the dry season. The Nongthymmai living root bridge. Picture by Glen (or Kurt?) Saunders. Erin Potter stands on a living root bridge near the village of Mynteng, about a 40 minute walk from Nongriat. I took this picture, though it was with Erin's camera. Glen Saunders stands mightily upon Tyndrong Bridge. As far as I know, I'm the first outsider who's reached this bridge in living memory (Glen is the second). The hike to this spot (about three hours one way) is one of the best in the area. Espied by small Khasi children. Photo by Erin Potter. More Khasi children...they're everywhere in those jungles. So, if any of that looked interesting, get in touch with me at anselmrogers4@gmail.com, and we'll go there! nice place. Aurangabad is great place for tourism, health and industrial area.